The tomato and cheese in the Parmigiana sauce combined with the beef mice gives these meat balls a resident pleasing flavour. Easy to eat in a soft pita pocket. Place mince, onion, KNORR Aromat Seasoning, oregano, basil, 100g KNORR Italiana Parmigiana Sauce GF, eggs & crumbs in a large bowl and use your hands to combine. Form mix into small meatballs and place on a lined tray ready to cook. Heat a splash of oil in a pan and seal the meatballs before returning to the tray and baking to finish cooking. In a small pot heat 350g KNORR Italiana Parmigiana Sauce GF. Make a small pocket in the pita bread ready to fill. 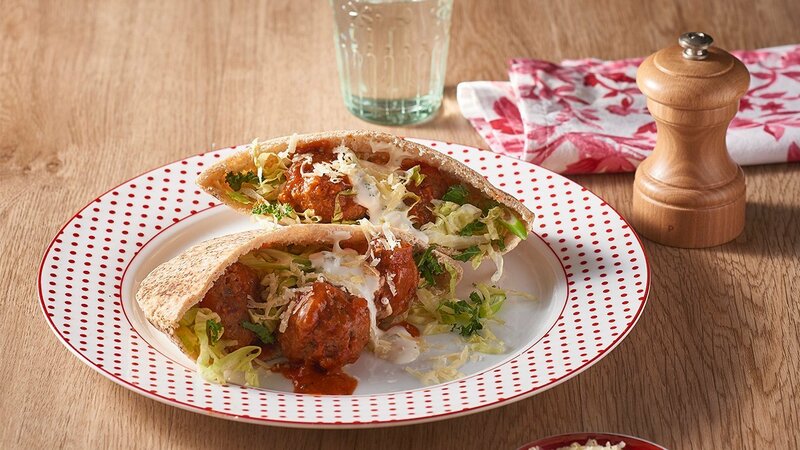 Place lettuce, cooked meatballs into the pocket and add sauce, topped with cheese.